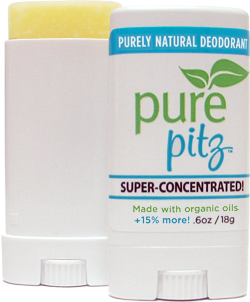 Pure Pitz is the clean answer to neutralizing body odor! Certified organic and made from only the cleanest ingredients including aluminum-free baking soda, Pure Pitz is a soothing emollient with fresh, subtle fragrances of pure organic essential oils. Preserved naturally, Pure Pitz comes in a BPA-free, eco-friendly plastic container and is the perfect size for travel and gym bags. The super-concentrated formula lasts 4 to 5 months for shaved armpits, and 1 to 2 months for hairier armpits. Pure Pitz is simply safe and effective!